The road to full-time blogging is a bumpy one. Sometimes, you feel like you’re standing on the edge of a new beginning. If only your blog could make just a few hundred more bucks a month, you could afford to quit your job and finally live the life of your dreams. What if I told you that it’s possible to sell your blogging services and make this lifestyle happen much faster than you thought? One way to do this is to launch an effective cold email campaign. Why Sell Your Blogging Services? As a blogger, you’re one step ahead of many writers attempting to break into freelancing because you already have a rich portfolio. As an intermediate to advanced blogger, you have all the data to prove that your blogging skills can drive traffic to a website. If you’re a beginner, selling these services can provide you with a cushy side income as you continue to grow your blog. If you’re still blogging part-time and want to take the leap to quit your full-time job, selling your services as a freelance blogger can help you get there much faster. Elna Cain is a great example of a successful serial blogger who used freelancing to stop working and nudge her way into blogging full time. She runs successfully monetized blogs like Elna Cain and Twins Mommy, but she also has a freelance writer website over at Innovative Ink. On top of that, you can gain more backlinks to your website if you sell bylined work for other blogs. Improving your blog’s rankings while getting paid for it? Heck yeah! What Services Can You Sell as a Blogger? Additionally, you might be able to turn other niche-specific skills into services. For example, if you blog about personal finance, you could work as a virtual assistant or bookkeeper for solopreneurs needing a bit of help on the financial side. In any case, marketing and successfully pitching your services will be the key to generating the income you need to make the jump. And that’s where a perfectly crafted cold email campaign can come in. In email marketing, open rates hover around 20% across all industries on average. This number tends to be lower for cold campaigns, in which you have no previous connection to your prospects. But it is possible to beat the odds when reaching out to cold leads to sell your services! In January, I partnered with GetProspects to launch a cold email campaign for a total of 110 leads. Together, we developed targeted copy for a total of 3 emails – one initial email plus two follow-ups. This first round of closed deals gained me $450. That doesn’t include the future contracts I may get from continued relationships with these clients. In the months that followed, I used what I learned from this case study and tried out a few variations on my own. From these experiences, here is my step-by-step process to get the most out of your cold outreach. This is where it all starts – and where it can all go wrong. For your cold email campaign to work, you need to target the right prospects. Find out which type of people could benefit from your niche expertise and discover where they hang out. Are they on AngelList, LinkedIn, Crunchbase, or other similar databases? Are you a food blogger who could target restaurants on Yelp? Make sure your prospects actually need your help. These could be companies who don’t yet have a blog, who haven’t updated their blog in a while, or who clearly could use better blogging techniques. My niche is digital marketing, so I target digital marketing companies who don’t yet have a blog. Before going any further, make sure you’re listing these prospects in a spreadsheet. Google Sheets work fine for this. Now, find out who to contact within a prospective company. I’ve found it better to contact the CEO directly if it’s a smaller company, or the marketing director if it’s a bigger company. This will depend on who you’re targeting. If the company’s website doesn’t have a page listing their team members, I advise looking them up on LinkedIn. Don’t forget to add the name of the person on a column in your spreadsheet. Now, all we need is an email. There are several tools you can use to get your prospect’s email, but I’ve found Hunter and Norbert to be the best so far. Hunter gives you 100 free credits per month, whereas Norbert gives you 50 free credits before you need to purchase more. However, Hunter can’t always find the right data. In my process, I try out Hunter first, then default to Norbert if I couldn’t find what I’m looking for. I’ve included a column for every key piece of information I’ll need to contact the prospect. You can add more columns for things like company size and location. For this example, I’m keeping it brief and showing you how I would do it. I like to have the first and last name separate to facilitate email merges, which we’ll talk about a bit later. Cold email campaigns tend to work much better when they’re… actually not cold at all. A good way to warm up your prospects is by following them on social media. Do a quick check on Facebook, Instagram, and Twitter to see if they have profiles on these platforms. Be sure to follow the person and not the generic brand profile. From there, take time to engage with their content. Like and share some of their recent posts. This will get you on their radar. Once they receive an email from you, they’ll have seen your name a few times already, meaning you’re less likely to end up in the trash bin without so much as a click. This is where the magic happens. If and when your prospect opens your email, you only have a few seconds to grab their attention. One mistake many people commit in their cold emails is to make it all about themselves. No one wants to get a direct sales pitch from a stranger. Instead of directly asking for a sale, intrigue them with something that can benefit them. The cold email is an opportunity to make a connection and position yourself as a solution to your prospects’ problems. If you offer them something that directly addresses their pain points — without asking them to swipe their credit card — you stand a better chance at getting a reply. I introduce myself as a solution to their pain point. I’m associating blogging with direct benefits (ranking higher on Google to get clients organically). I close with a call to action (asking to email me back if they’re interested). I’m not asking for a sale; I’m trying to open up a dialogue. Do all these things, but be brief. Your prospects are probably busy sorting through heaps of emails. The last thing they want is to be hit in the face with a wall of text. Now, one email won’t do. More often than not, your first email will fall through the cracks. It may get opened by an interested prospect who forgets to respond because they were interrupted while reading your email. 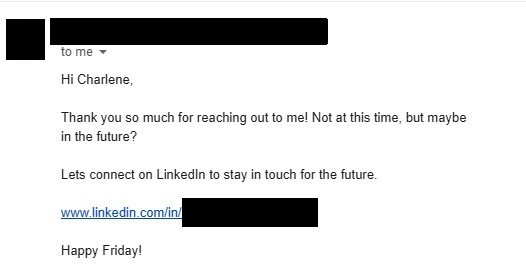 This is why follow-ups are the key to success in the cold emailing game. Note that in my last email, I don’t go out completely cold. I let them know that I will stop contacting them, but that my door is always open if they change their mind. There are several ways to launch a cold email campaign. One way is to manually copy and paste your email copy and change the prospect name, company name, and other personalized fields by hand, then send it along. Not only is this time-consuming, but it makes tracking your metrics and follow-ups nearly impossible. Luckily for us, there are tools that exist to make our lives easier. Let’s start with the free tool Streak. It’s a handy Google Chrome plugin that can be used via Gmail and GSuite and it’s what I used in my very first cold email endeavors. Generally speaking, you’ll want to add such personalization fields to include your prospect’s first name, their company name, and in some cases, their website URL. A word of warning – make sure your data is clean. If your spreadsheet lists a company name as Acme Incorporated LLC, cut out the unnecessary words and just keep Acme. Otherwise, your email will look scripted. Also, include personal information like their birthday and their favorite food. Just kidding, don’t do that. Avoid over-personalizing an email to steer clear of the creepy factor. Another tool I’ve used is Mailshake. Although this is a premium tool (pricing starts at $29 USD per month), it was built specifically for cold emailing. Mailshake is really handy when you want to send out several emails at once. A 27% open rate is still in the average, but it’s significantly less than my smaller campaigns. Plus, this got a whopping ZERO replies. Yikes. So, I decided to test out a new tool: Cliently. Cliently doesn’t give you as much automation as Mailshake, but it does allow you to personalize every email sequence for each individual prospect. That means you can add a custom introduction line tailored to the business you’re targeting. This decreases your chances of landing in the spam folder and creates a more personal connection with your prospect. Note that the above campaign isn’t finished yet, so I’m hoping to drive up the reply rate with a few more follow-ups. A fun feature of Cliently is the ability to use credits. You can purchase a monthly package of these for a set price to send REAL postcards, gift certificates, and even hand-written letters to your prospects. I don’t plan on using this quite yet, but this may be useful for those who have the budget to invest in prospect nurturing. You have the choice of importing a CSV file to Cliently or using their lead generation tool. I won’t go into this now since we’ve already covered list-building above. If you’re using a tool like Mailshake or Cliently, be sure to constantly track your metrics. This way, you’ll find out what causes the most friction in your process. For instance, if you have an amazing open rate, but almost no replies, you know that your subject line probably works, but that you need to tweak your email copy a bit. On the other hand, if your open rate is dreadfully low, you probably need to optimize your subject line. Mailshake does have an A/B testing feature, but it’s only available starting at their mid-range pricing tier. Test out a few variations in your email copy, time of day to send the email, subject lines, etc. and optimize your campaigns as you go. Here’s a question I get a lot: Is cold emailing legal? The short answer is that it depends on where your prospect lives. I’m from Canada where cold email is 100% prohibited since 2017. You absolutely need consent before sending an email, even for business purposes. Because of this, I only do cold outreach to U.S. companies. There must be a clear way for your prospects to opt out. This can be as simple as adding ‘reply no if you’re not interested’ or having an ‘unsubscribe’ button. Never, EVER use tools like ConvertKit to send out cold email campaigns. This is strictly against their policies and could get you banned from the service. You can opt to either send your cold emails manually, use mail merging tools, or use a cold-emailing system like Cliently or Mailshake. 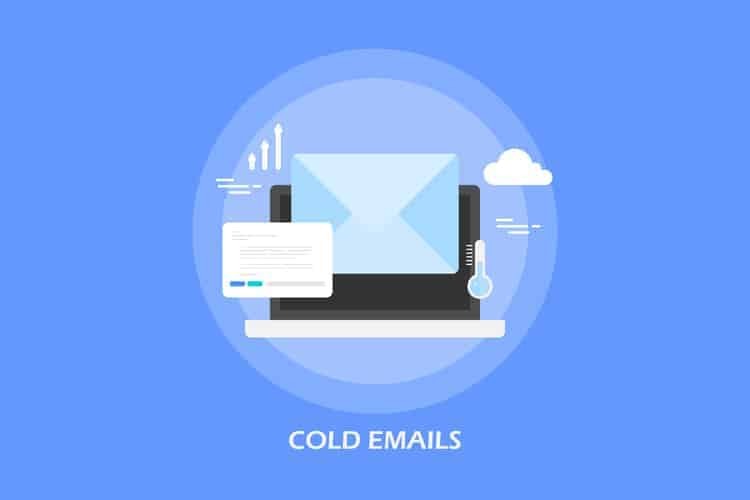 Cold emailing provides you with an extra channel to create contacts in your niche, build links, and new opportunities to grow your income as a blogger. When done right, you can spend a few hours a week on cold emailing and gain a few new clients every month. Take it a step further by adding Albacross to your website. This tool collects email information from businesses who visit your site. It’s a great way to generate leads that are more qualified than completely cold prospects since they know you exist and have shown interest in visiting your site. What are your thoughts on cold emailing? Is this something you plan on trying in the future? Charlene Boutin is a freelance B2B writer for hire specialized in creating compelling case studies and blog posts for digital marketing and SaaS businesses. When not writing, she can be found prototyping weird games in Unity or playing on her Nintendo Switch.